NBYT is rehearsing an adaptation of the Roald Dahl adventure, James and the Giant Peach, for performances on May 29, 31 and June 1 at Trinity-on-Main Performance Center. In James and the Giant Peach, Roald Dahl’s fantastic story comes to life. Young James Henry Trotter wants to escape when he is sent to live with his mean Aunt Spiker and cruel Aunt Sponge by the shore. After a mysterious man appears with a bag of magic, a peach in their garden—and the bugs and worms living inside it—grow to an enormous size. Together, James and his new friends travel on an incredible journey across the sea. James and the Giant Peach stars children ages 8 through 14 and is appropriate for audiences of all ages. The cast and crew of thirty-four children has come together from New Britain, Avon, Berlin, Bristol, East Hampton, East Windsor, Farmington, Middletown, Plainville, Southington, Terryville, West Hartford, and Windsor. “One of the most fun challenges of James has been to create the peach itself and the costumes for the bugs and worms,” says production director David B. Sousa. 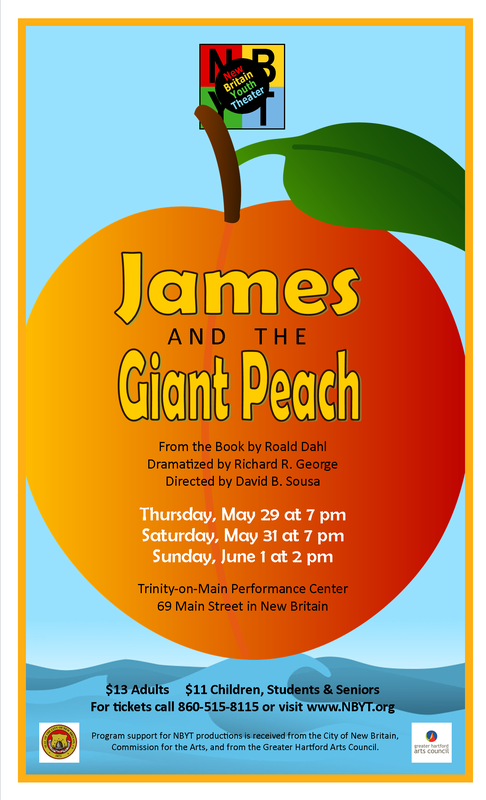 James and the Giant Peach will be performed at Trinity-on-Main Performance Center, located at 69 Main Street in downtown New Britain. Performances are Thursday, May 29 at 7:00 p.m.; Saturday, May 31 at 7:00 p.m.; and Sunday, June 1 at 2 p.m. Ticket prices are $13 for adults and $11 for children, students, and seniors. Tickets may be reserved by calling New Britain Youth Theater at 860-515-8115 or may be purchased online through Brown Paper Tickets. Previous Previous post: Take a peek at GREATness! Next Next post: Help Send a Child INTO THE WOODS!